So, in the quiet morning, I find myself trying to sort through all the mental confetti that floated down through my brain while on my sick bed this past week. But I’m tired of thinking, and I don’t want to reflect any more. An urging deeper than the silent reflections prompted me to take my camera and go to Camp Dularge and spend some time up there, while the Who Dat Nation was still fast asleep, visions of touchdowns dancing in their football heads. What awaited me was something I could never have predicted–not if I lived to be a hundred. As I sat in down in my deck chair to listen to the little pop-chock birds chip away in the trees, I heard, “Who? Who? Whoooooooo?” I answered while visually scanning the branches of the ancient oak. “It’s just me. I own this place. Whooo are you? I think I’ve heard your voice before at night. What are you doing talking to me in the morning?” Then my eyes spied what looked like big furry ears sticking out above what I have been calling a squirrel’s nest all these months. The morning sun shone through individual tufts of fur. Is that a squirrel? A cat? What IS that? No, it can’t be, I thought, eyes squinting for better focus. Barred owls don’t have cat-like ears. I arose slowly and tip-toed across the deck, trying to get a better look at this curious creature, which sat stock still, not even batting an eyelid. No view was better than the one from my deck chair, so I sat back down. Binoculars. I need binoculars. I found a cheap pair inside the camp that wouldn’t focus worth a flip and only served to further frustrate my efforts to identify the nesting resident. Ah, I’ll put the zoom lens on my camera! Where’s my camera bag? Regretfully, I had only obeyed half the order given me by my prompter. I spoke to my guest, “Please stay right there. I have to go home, but I’ll be right back.” Down at the house, I grabbed a good pair of binoculars, my Sibley Field Guide, and camera bag. The zoom lens still didn’t give me quite a close enough look at the animal’s face. It appeared to have white eyes that never blinked. White eyes? I quickly swapped camera for binoculars. Sure enough, those were big furry ears. But the two white things I thought were eyes appeared to be the equivalent of eyebrows on a human and actually sat above closed eyes. Like all the other Who Datters, this Who Dat was also sleeping. Sound asleep, not a care in the world. That explains why all my moving around and poking about didn’t disturb her. So, maybe, just maybe in about five weeks, Camp Dularge will have its own Who Dat Nation residing in the back yard. 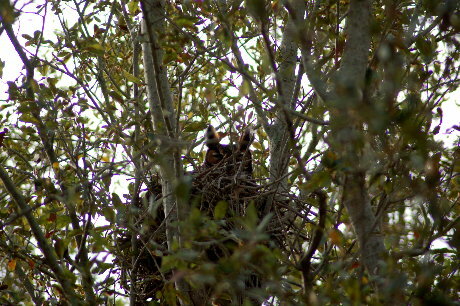 Great horned owls have only one clutch each year, with 1-4 eggs per clutch. Incubation takes between 26-35 days, and within a month after the hatch, the new owls will learn to fly. It is my hope that Who Dat (now her official name) will take to this nest, lay her eggs there (if she hasn’t already), and raise her young while I observe ‘neath the old oak tree. And dat my friends, is the end of one and the beginning of another story! What an exciting story! Do you know I’ve yet to see an owl of any sort? It’s just crazy, because I’ve been in places where I’ve heard plenty of them. Either I’m not focused enough, or too focused, or whatever. The nature center up the road on Armand Bayou has “owl prowls” during the year – I’ve been thinking I should do that and just haven’t. Maybe this will get me moving. Sorry to hear you’ve been feeling poorly – I missed that, somehow. I had a good bout of the “whatever” between Thanksgiving and Christmas. It was no fun, and it lingered. Take care of yourself! Did I ever tell you the absolutely true story of the Cajun-Chinese restaurant down in Fulton, TX? It’s name? What else? Hu-Dat! Well, Shore, you know they don’t get out much in the daytime, and at night they’re kind of hard to see, so I’m not surprised you haven’t yet seen an owl! I think the Owl Prowl is a grand thing to put on the list! (I never mentioned that I was sick, that’s why you missed it). No, I don’t think I recall hearing about that restaurant. What an odd combination! Hu-Dat? Are you serious? Maybe Cuz is on to something. I don’t watch her show, but maybe she features funny stuff like that. How exciting. Amazing picture and I can’t wait until you have some Camp Dularge children. It will be hard to see them, but I hope I’m there watching the day they learn to fly! Is that a good enough reason to invest in a video camera? Wendy, how exciting! You have a lot of owl-watching to enjoy in the next couple of months. We got to follow a nest last year in a nearby park, starting with this chick. Kay, that is an absolutely gorgeous photo of the mother owl. I could not see one of a chick. Anyway, what a beautiful creature! Thanks for sharing. There’s a beak and an eye sticking out from under the wing. Here’s are a couple of later photos of the chick. It’s delightful to watch them grow, and it happens so quickly. We found that there were significant changes with three days between visits. Great photos Kay! My husband says I am a night owl and after seeing the photo in the 2nd link, I would say he’s correct since my hair looks exactly like that!! Cuzzy, I’ve always been fascinated with owls. She’s a cutie. Someone once told me an old wives tale, that owls around your home is bad luck. I don’t cotton to that nonsense. I figure if you have an owl near-by it must be good luck. Lucky you, to have a nest in the back yard! Keep us posted as to the arrival of the little ones, won’t you? shoreacres…that’s too funny! You should take a picture of the restaurant sign and send it to Ellen DeGeneres’ show. Yes, it’s been said owls are a bad omen, but I don’t accept that, either. Such a perfect little story. You’re so good. I caught an owl once who must have been injured because he was sitting in the middle of a country road. I got a blanket out of my trunk and put over him and brought him home and put him on the kitchen table. He sat there for a few days till my husband said enough owl in the house. Love the way you tied this in with the Saints story, and the catchy title from your dad. You who are always on the lookout for a good story sure have a way of finding them! Middle of the kitchen table? You were brave! Somehow, the stories find me, and it’s very rewarding! Bet the chicks have or are about to hatch. They hatch here about Feb 1st. Right in time for thaw and easy pickings of field mice etc. Hm. Seems like there would be more noise/activity—as I visit camp every morning. Except, maybe they hatched while I was sick for four mornings? My grandfather had a pet screech owl for most of my childhood. In in am out at pm. Had a perch on back porch. That’s just straight up cool! WOW. How cool to be godmother to a horned owl. 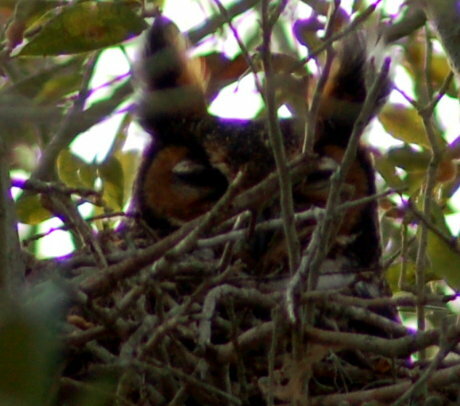 I have seen barn owls ,and in FL, ground owls that live in burrows but never a horned owl and only a few glimpses of barred ones flapping by on their great wings. too cool. I heard that for one to hoot outside your window at night 3 times in a row is whats bad luck lol. Personally right now I think you are pretty lucky. The “Hootin” variety have been talking to each other in our neighborhood for a while now. We can hear them in the distance. I’m glad they are “Hooters” we hear. As a newlywed, we lived in the in-laws camp (our first home was being built) on the Amite River. One night we heard a Screech owl calling from across the river. It scared the you know what out of me. Hubby got a real kick out of my reaction. I’d never heard one before and it made the hair on the back of my neck stand out! Glad you’re feeling better. I’m still hacking myself. Mine started Christmas night. Enough already! I don’t have owls (two in-and-out cats) but the cats invite the possum and raccoon mommies to share their dry food in the spring. And yes–I’ve seen an occassional “critter” in the hall noshing on the ever-present dry cat food. Hot diggedty dog! You’ve got a great horned owl! How totally cool. As soon as you said ‘tufts’ I knew who who who your visitor was. Who Dat is the perfect name, too. I’ll expect regular updates, you know. I spent quite a bit of time sneaking online at work to check out the potted plant owl in South Africa some months back. I had to; by the time I’d get home, it was dark there and I couldn’t see anything. Sorry to hear you’ve been under the weather this past week. WOW…what spectacular good fortune to have come visit ye! In Vodun (Voodoo) the owl is linked to Damballah – the Sky God and considered the primordial creator of all life. Among other attributes, Damballah rules the mind, intellect, and cosmic equilibrium. Our esteemed mate Maman Miriam (Priestess Miriam Chamani of The Voodoo Spiritual Temple, New Orleans) recommends as offerings cold water, milk, coconut, coconut milk, honey, shea butter, rice, mild cigars, bread, and cookies. Clearly an auspicious sign for ye! You have an interesting guest. We have an owl living nearby that is about 2-3 ft. tall. It has been around for about 8-10 yrs now. The first sighting was at about 6 am one morning when my son and daughter in law dropped off my little grandson whom I babysat. As they started back out the front door, that thing let out a LOUD WHOOOOO Whoo whoo and we all jumped. It was in my elm tree about 30′ from the porch and we all saw it. None of us had ever seen one that large before. I heard it frequently after that and a few months later, was sitting on the porch just after sunset when it flew by. The wing span was enormous! And it litterally swooped down after something in the medium but immediately went back up because a vehicle was approaching. We still hear it 3-4 times a month but not from our tree which lightening took out. It sounds like it is about 3 houses south of us where a grove of trees are located. Glad you are feeling better. Hope it wasn’t the sniffles and cough you had. That stuff hits hard and hangs on. I got the krud starting this weekend. My type 2 don’t like it sugars running low. I read and heard from the watchers that more snowy owls are here in central Illinois. One stayed year round about 7 miles south of me few years back 2-3 years. Used to run into a barn owl that was a better fisher than me down by TerraHaute, In. It’d have 2 pound catfish for breakfast then sleep it off on deadfall over water. You could get close but I never carried camera then. I know a photographer in Kansas who’s about to have a fit. The snowies are in his area and all his neighbors have seen/photographed them. He runs the roads looking, and can’t see a one. I told him to stop running, sit down on his porch and watch the woods. His chances of seeing one would be as good, and he wouldn’t get as tired. That’s so neat. We’ve had a Bald Eagle flying around for a while now but he nests up the road on a friends property, she has some great photos. Had a guy set up middle of the road with 2 foot long telephoto lens I swerved to avoid once. I am going fishing with the Krud. Lot of owls at nuke lake I was fishing started hooting at 3pm. UPS brought a bushel of kumquats. Woo hoo…. taking the krud back to bed though…. I knew that surprise was on its way!! You are welcome : ) Even though they were not sent by me . . . .
Did I hear someone say, “Kumquats” ???????? A whole bushel of ’em? I’d be in heaven. BW, hope you’re throwing off the crud and feeling better. Gue – am feeling better and have been playing catch up since Monday. Will hopefully get to personal email soon–but with two tours on Thursday and one on fRiday, it might be a couple more days. Thanks for thinking about me! Bottle of brandy and 5 lbs sugar bought. Be good thing to mess with during pending blizzard through weekend. Sore throat not liking tart. Sore throat need fresh Vitamin C.